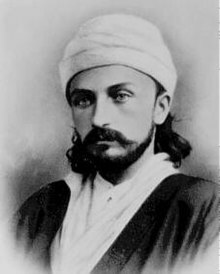 `Abdu'l-Bahá, whose birth name was Abbas Effendi, was the eldest son of Bahá'u'lláh, founder of the Bahá'í Faith. He took the name `Abdu'l-Bahá (meaning "Servant of Bahá") to both honor and clarify his subsidiary relationship to his father. He was appointed his father's heir, and sole authorized interpreter of the scriptures of this religion.